Welcome May Opal WordPress is so happy and proud to release a new theme on Themeforest named CoolStuff Creative multi-purpose eCommerce WordPress Theme based on WooCommerce. 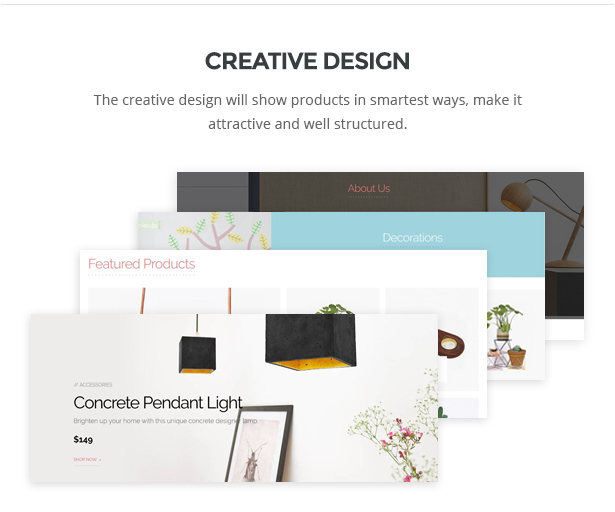 With a purpose oriented and creative design, responsive layout, the theme will show off your products in smartest ways. It is a complete-feature ecommerce theme to build stunning E-Shop for any kind of online Business: Decor, Furniture, Flower, Fashion, etc. 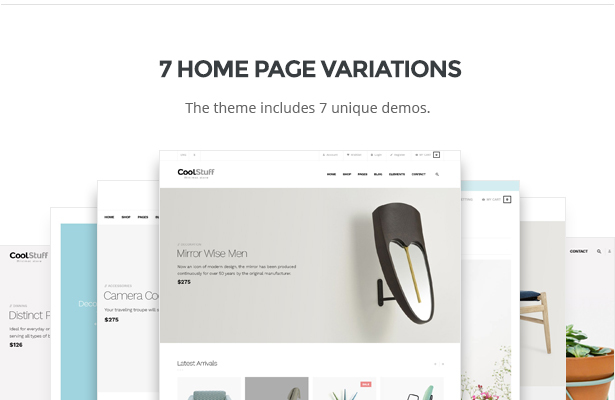 With 7 different premade demos layouts, CoolStuff is impressive and eye-catching in customer’s heart. You can choose the best suitable one for your business store. 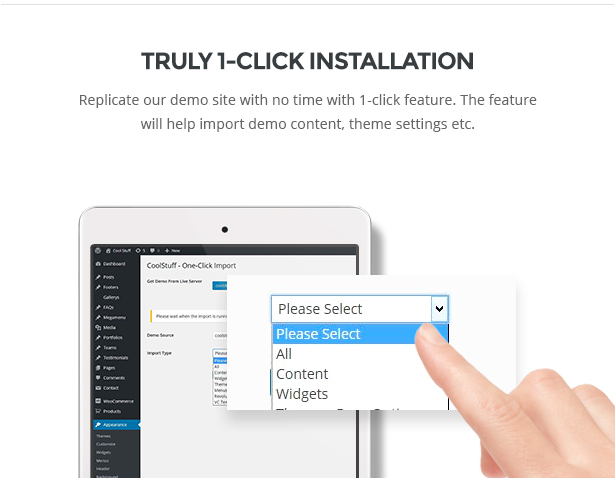 The amazing 1 click installation allows you to replicate our demo on your sever in no time. The WooCommerce theme is highly customizable. 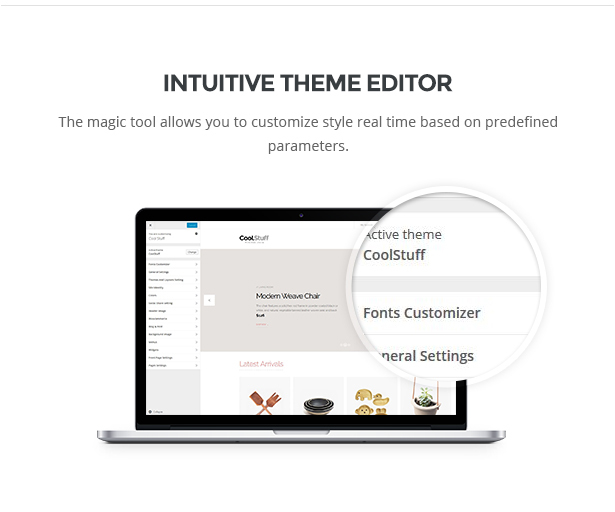 The intuitive theme control panel and live theme editor to customize the theme real time based on predefined parameters, no coding is required. 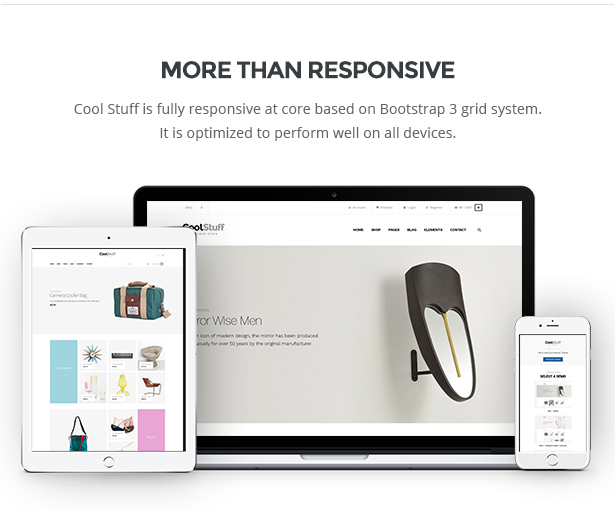 CoolStuff is built with new web technologies and well optimized to improve the performance. It supports lots of widgets to save you tons of time with content building. SAVE YOU $51 – The WordPress theme includes the best selling slider plugin – Slider Revolution (save you $18) and the amazing WordPress builder – Visual Composer(save you $33). Now we will give some core features in details. This Multipurpose WordPress Theme is designed and tested to be 100% responsive so it works & displays flawlessly on all types of devices including smartphones, tablets, computer and larger screen. With 7 awesome premade demos layouts, you can choose a suitable theme for your online store, you have complete control over the look and feel of your website, layout, colors and content. No coding skills needed, we made everything flexible. CoolStuff is well developed with 4 colors theme variations: Default, Red, Blue and Yellow. 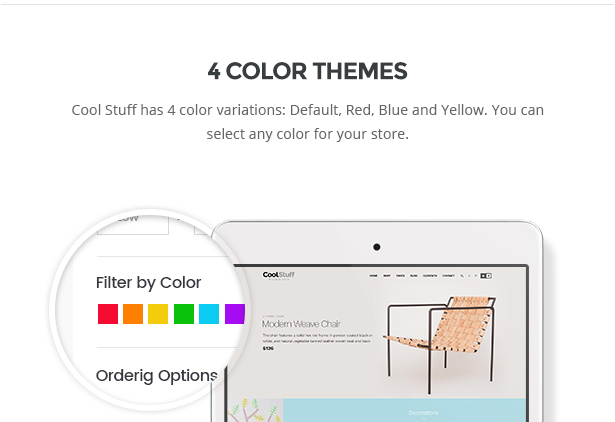 You can easily select any favorite color for your online store. With a modern and creative design style, CoolStuff WooCommerce WordPress Theme comes to users’s heart by a warmly emotion inside Wonderful Image Sliders. It is a great way to showcase your latest products or important information. You can easily make slides with text, links and any products you want. Your website will look attractive and well-structured. With a truly tool “Theme Editor” you can easily customize style your website performance based on predefined parameters. You can change header style, footer style, color, menu as the way you want. 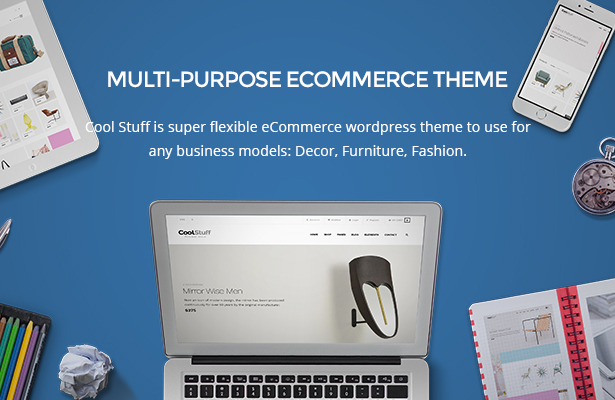 In conclusion, above is all the features of CoolStuff Multi-Purpose WooCommerce WordPress Theme , you can read and experience it. In the process of setting up, there are any problems, leave a below comment or contact us via our above support channels, we will answer you right now. Remember to follow our social channels Facebook, Twitter, Linkedin, Youtube, Pinterest to get it!